i've been promising this recipe on the blog for a while, and here it finally is. 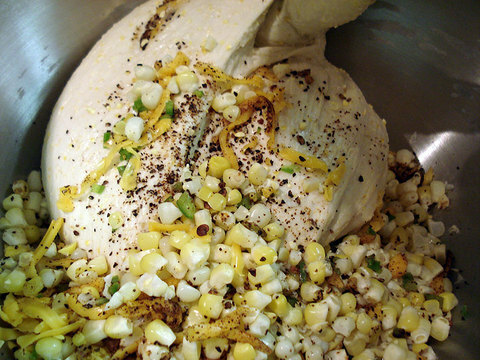 the photo is the dough at the point where the corn, cheese, and chilies are being mixed in, which is the point at which you can really start to smell how everything is going to turn out. In a small bowl, combine 1/2 cup/118 grams/4.1 ounces of the water, 1 cup/156 grams/5.5 ounces of the flour and 1/8 teaspoon of the yeast. Stir the mixture with a wooden spoon for about 3 minutes or until the dough is very smooth and pulls away from the sides of the bowl. It should still be tacky (sticky) enough to cling slightly to your fingers. Cover the bowl tightly with oiled plastic wrap (or place it in a 1 quart food storage container with a lid) and set it aside until doubled and filled with bubbles. At room temperature it will take about 6 hours. Stir it down and use it or refrigerate it up to 3 days before baking. Remove it to room temperature 1 hour before mixing the dough. In a stand mixer bowl, place the remaining 1/2 cup water and honey. Tear the biga into the bowl, in a few pieces, and stir it together until it is soft. Add the buttermilk and remaining flour and with the dough hook mix on low speed about 2 minutes, until the flour is moistened to form a rough dough. Scrape down any bits of dough. Cover the top of the bowl with plastic wrap and allow the dough to rest for 20 minutes. Add the cornmeal, polenta, remanining instant yeast, and garlic and knead the dough on medium speed for 6 minutes, adding the salt after these ingredients are mixed in. The dough should be elastic and smooth, and sticky enough to cling slightly to your fingers. It will clean the bowl completely. Cover the bowl and let it rest for 15 minutes. Place the dough into a 4 quart dough rising container or bowl, greased lightly with cooking spray or oil. Press down the dough and lightly spray or oil the top of the dough. Cover the container with a lid, plastic wrap or a damp towel. With a piece of tape, mark where double the height would be (just up to the mid ridge). Allow the dough to rise (ideally at 75°F to 80°F) until doubled, 1 1/2 to 2 hours. Turn the dough onto a floured counter and divide the dough in two. Allow it to sit covered for 15 minutes. Then flour the tops and shape into a loaves. It will be very supple and elastic. (It should not be too soft in order to hold its shape in the pan.) Set the dough into the prepared loaf pans (they will be 3/4 to 1-inch from the top) and cover with a large container or oiled plastic wrap. Allow them to rise until almost doubled and when pressed gently with a finger the depression very slowly fills in. (45 minutes to 1 hour). They will be 3/4 to 1 inch from the sides of the pan. 5) Preheat the oven 1 hour before baking time to 375°F. Quickly but gently set the baking pans on the hot stone or hot baking sheet and toss 1/2 cup of ice cubes into the pan beneath. Immediately shut the door and bake 20 minutes. Turn the pans half way around and continue baking for a few minutes or until the bread is golden brown and a skewer inserted in the middle comes out clean. (An instant read thermometer inserted into the centers will read about 200°F.). Remove the bread from the oven, unmold each from the pan, and transfer to a wire rack to cool completely, top-side up. *NOTE: i use a spice mill to chop the chipotle.